an image from a 1958 hi-fi and music review magazine of "record grooves seen through a microscope". too bad they didn't say what record it was... note the particulary wavy bass tones in the center. image of an 1866 "ribbon map" from a 1975 issue of design quarterly devoted to the mississippi river. "the linen-mounted map unrolls from a wooden cylinder in a strip about 2 inches wide by 129 inches long and shows plantations, towns, landings, and mileage points along the mississippi as they existed just after the civil war." 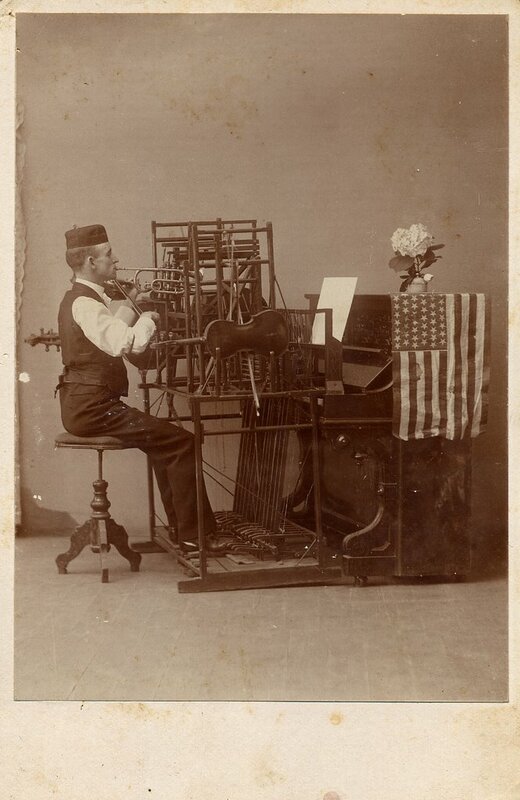 a little over a year ago (august 29th 2006 to be exact), i posted some images of CDVs of one man bands and their musical contraptions from the victorian era (click here to see that original post). some were stamped with a performer's name, but one of the images had no printed text or information other than a messy signature on the back that reads something like "chisolm". since i've been collecting photos, i've been amazed by a number of finds like this, where things that have been separated for about a hundred years have found their way back to each other. the above image is the new photo, and you can click here to see the older one. "...it is safe to say that old forms of the cinema will disappear. the film has nothing to do with the symphonic, spatial organization of the stage elements. its task is to break clear of all imitation of the theater. the film has grown mature enough to create its own form of architecture which must signify 100 percent cinema. our age is an optical one. the rapidity of events and their brief duration require a receding apparatus that can register as speedily as possible. it is the eye. the speed of light waves exceeds that of all other waves. the film is the optical flying machine of camera. the film is a play on surface, the theatre a play in space, this difference has not been realized concretely in any architecture, either that of the theatre or the cinema. the ideal cinema is the house of silence." frederick j. kiesler, 1929, from selected writings. tiny blurb from the wireless news column of a 1953 radio and tv news magazine. "one ought to concentrate on all that's primitive and fresh in the language with boundless avarice. no other words should be recognized than those strikingly fragrant. the ones smelling of the sea are the best. if you have the right vernacular you have the right philosophy." "a book - glimmering from fire and salt - should be like a good storm, continual, powerful, ceaseless, with a sharp murmur as night falls." "the greatest moment: like the silent interplay of shadows in a budding forest - the slience of a thought's interacting shadows extending inside me." "to be consistent can sometimes be easy enough. to be honestly inconsistent can be more difficult." "i am but an eye looking into the blind and ghastly eye of meaninglessness. why? who am i? the howling lonliness around the human." some gems from vilhelm ekelund, written circa 1914, from a collection of his writings called "the second light". from philip corner's small book: pieces of realities for some days : (italienische reise) - "a series of simple tracings of objects picked up, each in a different place in italy during the summer of 1983". thomas ustick walter was one of america's most important architect's of the early to mid 1800's, and played a major role in the founding of the AIA (american institute of architects). walter designed the iconic u.s. capitol dome, as well as the 1843 girard school for orphans - which is largely considered his greatest achievement, and was the most expensive building project in america before the civil war. most of walter's designs are in a slightly over the top greek revival style, and indeed many of his works of the mid 1800's are hybrid masterpieces of early american and greek designs. while doing research on walter's work, i came across some very strange architectural drawings he did as teaching aids for a sunday school class he taught for much of his life. this image of solomon's temple, was based entirely on descriptions from the bible, and compares the scale of the temple with two popular and well known buildings of the time. it's a wonderfully odd and modern looking building that seems totally out of character with most of walter's work, reminding me a bit of some early 20th century italian architectural experiments - the overbearing towers of sant'elia and the austerity of terragni. it is stamped "rothschild los angeles" on the back, and the image is of an amazing display for the rocketdyne company from some kind of trade show. note the north american display company employee hand painting stars on the wall. i've lamented the nearly vanished art of the hand painted sign for years, but never really thought about the extinction of the man who paints stars... click on the image to see it bigger, it's worth it. nice recording from a '67 issue of canadian art magazine featuring a short interview with artist zbigniew blazeje, and an excerpt from his "audio kinetic environment" that was featured in the canadian pavilion at expo 67(the building above that looks like an upside down pyramid). it's too bad the "interview" isn't longer, as i would've liked to hear more of his ideas (although the sounds are pretty nice as well). just 9 years after corbusier, varese, and xenakis's philip's pavilion, it seems the hybrid of electronic music and architectural space had blossomed into a relatively commonplace practice - particularly in the context of spectacle in expos and world's fairs. two RPPCs circa 1900 of little kids having music and dance lessons. for anyone interested, i posted some more images of my brazil installations: when stars become words..., on my website. rainbow no. 1 for orchestra: soap bubbles are blown out of various wind instruments. the conductor breaks the bubbles with his baton. drip music: for single or multiple performance. a source of dripping water and an empty vessel are arranged so that the water falls into the vessel. piece for ben patterson: construct a piano with the treble on left ascending to the bass on the right. play all the old favorite classics. music for piano no. 5 (flux variation): an upright piano is poitioned at center stage with its profile toward the audience. the pedal is fixed in a depressed position. a performer, hidden from view in the wings, throws darts into the back of the piano according to the time pattern indicated in the score. south no. 2 (for nam june paik): pronounce "south" during a duration of more than fifteen minutes. pause for breath is permitted but transition from pronunciation of one letter to another should be smooth and slow. all texts from the fluxus performance workbook, edited by ken friedman. my one "free" day in porto alegre, i visited the expointer, which is a fairgrounds spotlighting agriculture of the rio grande do sul area of brazil. i expected the gouchos, animals, farm displays, etc. ; but i was totally unprepared for the architectural surprise pictured above. these three painted metal spheres (the colors are related to the rio grande do sul flag) are actually large rooms that one can go inside of, and they are connected by two small pedestrian bridges forming a path from green to yellow, and through red. seeing that the spheres were a gift to brazil from germany in 1974, their relationship to 70's utopian architectural experiments (such as the work of haus rucker, archigram, superstudio, or the 60's expo experiments of charles eames, bucky fuller, etc.) makes sense; but they certainly have an uncanny presense in the current landscape of the outskirts of porto alegre. it's always interesting to see what happens to these things, once their experimental moment has passed. there was something wonderful about the once cutting edge exteriors being filled with small craft booths and people selling things made of yarn, handmade dolls, etc. via an assortment of makeshift tables. it would be nice to think that disney hall might have the same fate one day, for this interior felt humbled, taken over by humans, and still somehow a container of dreams. "it is true that exhibitions have become part of our lives. it is therefore impossible to suppress them. but they must not be encouraged. they destroy art, by making it a trade which artists no longer respect. the exhibitions are no more than bazaars in which mediocrity is impudently flaunted. they are useless and dangerous..."
jean auguste dominique ingres, passages from his correspondence and studio talk as reported by his pupils circa 1870, quoted here from sources & documents in the history of art, neoclassicism & romanticism 1750 - 1850, volume 2 restoration/twilight of humanism. a photo of a model of a british space ship, from a 1947 architecture magazine. the model was presented in the "future" section of the "britain can make it" exhibition of the same year . "the design is neither complete fantasy nor it is immediately practicable. it is, however, a "design fantasy" based on legitimate scientific assumptions... my problem as a designer, was to obtain an esthetically satisfying solution of a technical problem... the spherical shape was the result of the following considerations:...to find a shape designed to travel at low speed in air and at high speed in airless space...the sphere gives the greatest strength-weight ration and resistance to shock... by analogy, all bodies traveling in airless space are spherical...the sphere is one of the basic sculptural elements and one which i find partiuclarly satisfying... the transparent outter shell can be likened to the invisible ceiling surrounding our planet..."
well, it seems fitting to return from working with wood and sound on an architectural scale, to discover the mammoth zobo phunnygraph in an old zobo musical instrument broadside circa 1900 that was waiting for me in my po box. the zobo musical instrument family was made by the j. and p. myers company in nyc, and consisted of a series of kazoo type instruments shaped like real brass instruments - including a 27 inch long "slide trombone". along with a listing of different zobo instruments, the broadside has suggestions for military band, bicycle band, female college quartet, and the amazing funny organ (which includes a 10 foot by 9 foot cardboard printed paper image of a pipe organ that a "zobo band" can stand behind). of course, the phunnygraph is the most amazing of the bunch - a crude richard tuttle-esque replica of an early phonograph made with a soap crate, a wooden packing box, and a pasteboard megaphone. the band should be stationed hidden inside the thing, while one person stands outside turning the crank (it's too bad they don't have suggestions on how to make a mammoth surrogate 78!). the whole thing looks a lot like one of russolo's "intonorumori" (and 5 kids and a gaggle of kazoos could probably give russolo the kind of noise-scape he was after).